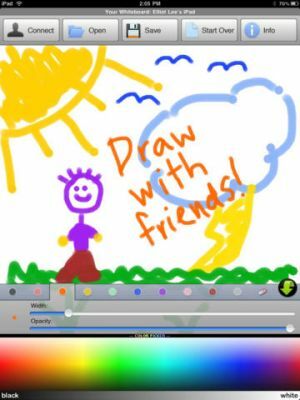 Whiteboard is the #1 collaborative drawing app for smartphones and tablets, with over 8 million downloads to date. Wirelessly connect two iPhone, iPod touch, or iPad devices over a local Wi-Fi network! � Open any image or photo on your device! � Change your marker transparency (opacity)! • Open any image or photo on your device! • Change your marker transparency (opacity)! • Choose any color you want, with the new full-spectrum color picker! • Image transfer: open an image while connected, and it will be wirelessly transferred to your artist partner! • Newly-redesigned interface! It's truly a pleasure to use. In the Info screen, disable the tab toolbar feature to get a full-screen canvas to play with. To bring up the drawing tools, tap the arrow button at the bottom right. • Fully compatible with iOS 4.3 and higher. "I love how fluid and natural it feels when you draw." "A picture is worth a thousand words... maybe more on the iPhone." • To erase the board without going back to the full-screen drawing tools, enable Shake to Start Over. Choose the Eraser tab -> under "Shake Action", choose "Start Over". ?�Fixed a bug that prevented Sharing from working.
? Improved selected color tab image and interaction. 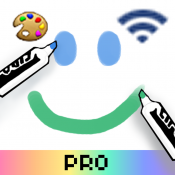 Con esta app los alumnos podr�n colaborar en tiempo real dibujando en pizarras compartidas.